Vegetables are cooked 'til crisp-tender and then tossed with penne pasta, cheddar cheese and a creamy dressing in this warm pasta salad. 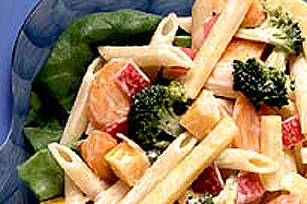 COOK pasta in boiling water until almost done; 5 minutes before end of cooking add rutabaga, carrots and broccoli. Cook until tender; drain. TOSS with remaining ingredients, except lettuce.